For the second year in-a-row, Cork broke Kilkenny's hearts with an injury-time winner to claim their 28th Liberty Insurance All-Ireland Senior Camogie title. This time, it was Orla Cotter who delivered the rapier thrust with a magnificent finish from a pressure-laden 60m free in the 61st minute in front of an attendance of 21, 467 - the highest since 2004. The St Catherine's player had won the free herself after two sublime pick-ups and swivels, though Kilkenny were unhappy at the award. 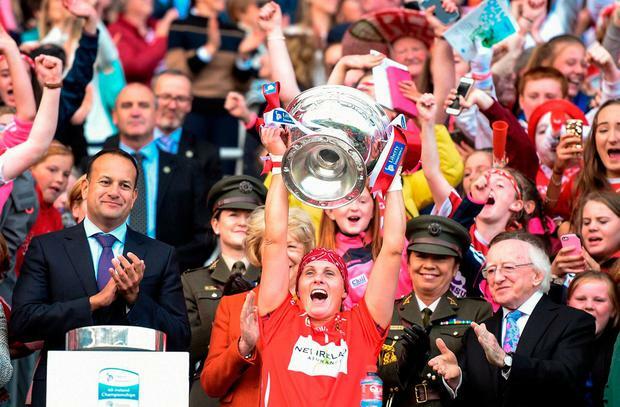 The win also moved Briege Corkery level with her long-time colleague Rena Buckley as the most garlanded player in Gaelic games history with 18 All-Ireland Senior medals between camogie and ladies football, although the Cloughduv player, who returned to the squad after giving birth to a baby boy last March, did not see any game-time in Croke Park yesterday. This also meant that the Senior/Intermediate double was achieved for the first time since 2013, with Paudie Murray emulating Galway's Tony Ward as manager of both the victorious sides. Wexford's JJ Doyle had achieved the feat with Wexford two years earlier. In the intermediate decider the Rebels defeat Down 1-13 to 0-9 with Caitriona Collins hitting 1-6 while minor star Saoirse McCarthy added four from play. After their loss in the senior final you would have to feel for Kilkenny, who gave so much and seemed to have timed their run to perfection when hitting the front for only the second time in the game in the 52nd minute. Cork: A Murray, L O'Sullivan, P Mackey, L Treacy; H Looney, L Coppinger, C Sigerson, G O'Connor, A Thompson, K Mackey, O Cronin, O Cotter, L Collins, J White, A O'Connor. Subs: L Homan for Collins (51), N McCarthy for A O'Connor (60+4).